Of all of the procedures to visit a dentist for, root canals are typically the most feared. What most people don't realize, however, is that these fears are usually based on myths - not on facts. At Bloor Family Dentistry in Alpharetta, GA, we think it's time to set the record straight! Here are the truths behind five incredibly common root canal myths. 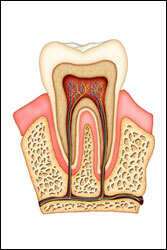 Root canals alleviate pain - they don't cause it. When you visit your dentist at Bloor Family Dentistry in Alpharetta, GA for a root canal, you will receive an anesthetic, making a root canal no more painful than getting a filling. Once the procedure is done and your mouth has healed, you should feel much better, not worse! A painful tooth isn't the only symptom that a root canal is necessary. Root canals treat infection in a dead or dying tooth. While infections can cause pain, they don't always. A dentist can let you know for sure if a root canal is right for you. This myth stems from faulty research that is over 100 years old, and that dentists have never been able to confirm or replicate. Modern medicine is also significantly more hygenic than medicine 100 years ago! While the amount of time for a root canal procedure varies based on the severity of tooth damage and the number of teeth that are affected, root canals are generally completed in only one or two office visits. You may need to make additional visits to be fitted for a new crown if your old tooth must be replaced, but the root canal process itself is not extensive. While extractions may be necessary in cases of extreme damage, for many Alpharetta, GA residents, having a dentist perform a root canal to restore their own tooth is sufficient. False teeth are very reliable, durable and lifelike these days, but most dentists agree that there is no substitute for keeping your own teeth if at all possible. Now that you know the facts, it is time to take action. Call Bloor Family Dentistry in Alpharetta, GA and set up an appointment to see your dentist today!